Have you ever been on or near the base and noticed something that just didn’t look right, but didn’t quite know what to do? 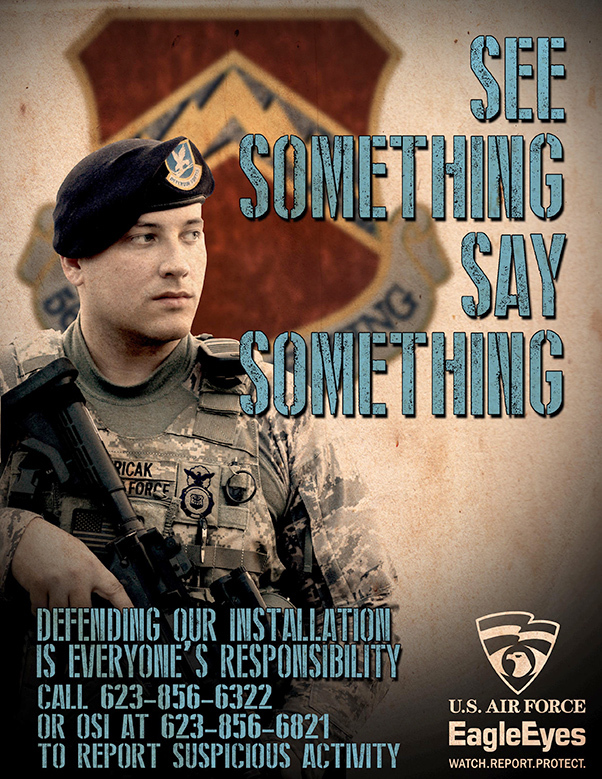 In an effort to highlight the role that all personnel have in insuring installation security and the importance of reporting vulnerabilities or suspicious activity, Air Force officials are urging all personnel to remember everyone is a sensor and if you see something, say something to security forces or OSI. If you “see something” that you know shouldn’t be there or looks like it could be a vulnerability to base security, or someone’s behavior doesn’t seem quite right or is troubling, then “say something.” This type of reporting is part of the integrated base defense program and the Air Force Office of Special Investigation Eagle Eyes program. The Eagle Eyes program is an Air Force anti-terrorism initiative that enlists the eyes and ears of all Air Force members in the war on terror. Eagle Eyes teaches all personnel about typical activities terrorists engage in to plan their attacks. Armed with this information, anyone can recognize elements of potential terror-planning when they see it. The Eagle Eyes program provides a network of local, 24-hour phone numbers to call whenever a suspicious activity is observed. 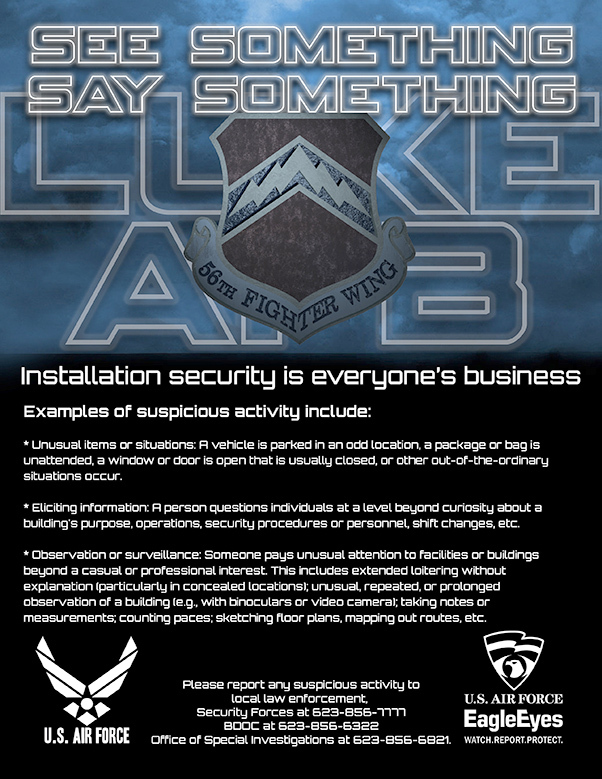 To report suspicious activity or vulnerabilities they see, base personnel at Luke Air Force Base, Ariz., should call the 56th Security Forces Base Defense Operations Center at 623-856-6322 or OSI at 623-856-6821. As always, if there is an emergency, call 9–1–1. • Size: How many people are involved? • Activity: What are the individual(s) doing? 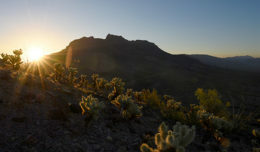 • Location: Where is the activity occurring? 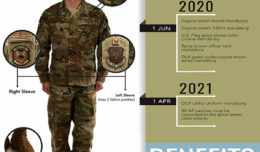 • Uniform: What are the individual(s) wearing? • Time: When did you see it? • Equipment: Were they driving a car, carrying equipment or anything else unique you can remember? • Unusual items or situations: A vehicle is parked in an odd location, a package or bag is unattended, a window or door is open that is usually closed, or other out-of-the-ordinary situations occur. • Eliciting information: A person questions individuals at a level beyond curiosity about a building’s purpose, operations, security procedures or personnel, shift changes, etc. • Observation or surveillance: Someone pays unusual attention to facilities or buildings beyond a casual or professional interest. This includes extended loitering without explanation (particularly in concealed locations); unusual, repeated, and/or prolonged observation of a building (e.g., with binoculars or video camera); taking notes or measurements; counting paces; sketching floor plans, mapping out routes, etc.